(3) Stefan’s law: Energy (E) radiated per second from a perfectly black body of surface area ‘A’ is given by E = AσT4 where ‘σ’ is Stefan’s constant equal to 5.57×10–8Wm–2K–4. If the body is not a perfect black body, E = AeσT4 where ‘e’ is a dimensionless fraction called emissivity. In the case of a perfectly black body at temperature T, with surroundings at temperature T0, the net rate of loss of radiant energy is E = Aσ(T4 – T04), since the body emits energy AσT4 and absorbs energy AσT04 per second in accordance with Kirchhoff's law. (4) Wein’s displacement law: λmT = constant (= 0.29cmK) where λm is the wavelength for which the energy radiated is maximum at temperature T. If the constant is taken as 0.29 cmK, the value of λm is to be substituted in cm. A black body is a good emitter as well as a good absorber. Initially it will absorb energy and hence will appear dark. Once it attains the temperature of the furnace, it emits better than the other parts of the furnace and hence appears the brightest. So the correct option is (a). Since the energy radiated per second is given by E = AeσT4 and the emissivities are equal, we have E1/E2 = (A1/A2)(T1/ T2 )4. Since the radii of A and B are in the ratio 4:1, the surface areas are in the ratio 16:1. Since the temperatures are 1000K and 2000K, the ratio (T1/ T2 )4 = 1/16. Therefore, E1/E2 = 1. This question indicates how one can determine the temperature of a distant star from spectroscopic data. According to Wien’s law, we have λmT = 0.29cmK, from which T =0.29/(5800×10–8) = 5000K. [Note that we have substituted the wave length in cm]. KA(θ–0)/L = 2KA(600 – θ)/L where K is the thermal conductivity, A is the area of cross section and L is the length of the identical rods. [ Note that the L.H.S. is the quantity of heat conducted through the lower single rod making the ‘Y’ and the R.H.S. is the sum of the quantities of heat conducted through the upper two rods]. From the section Thermodynamics, you will usually get questions on heat engines or refrigerators. You will definitely remember the expression for the efficiency (η) of a Carnot engine: η = (Q1 –Q2)/Q1 = (T1–T2)/T1 where Q1 is the heat absorbed from the source at temperature T1 and T2 is the heat rejected to the sink at the lower temperature T2. (c) reach absolute zero temperature (d) eliminate frictionThe correct option is (c). The efficiency is given by the expression, η = (T1–T2)/T1. The percentage efficiency is [(T1–T2)/T1] ×100. This shows that the efficiency is 100% only if either the source temperature T1 is infinite or the sink temperature T2 is zero. Both are impossibilities. (a) 320 K (b) 100 K (c) 273 K (d)250 K (e) 200 KIn a Carnot engine, Q1/T1 = Q2/T2 so that the temperature of the sink, T2 = T1Q2/Q1 = 400×640/800 = 320 K.
(e) 250 J of work is done on the systemThe internal energy of the system will decrease when the system does work and/or gives off heat. Since the heat given out is 150 J and the reduction in internal energy is 400 J, the work done by the engine is 400– 150 = 250 J. When the internal energy is reduced, the system is cooled. So, the correct option is (b). The temperature inside a refrigerator is 4°C and the room temperature is 27°C. How many joules of heat will be delivered to the room for each joule of electricity consumed by the refrigerator? ( Treat the refrigerator as ideal). (a) 1 J (b) 12 J (c) 8.3 J (d) 13 J (e) 6 JThe coefficient of performance of the refrigerator, β = Q2/W = Q2/(Q1– Q2) = T2/(T1–T2) = 277/(300–277) = 12. [Note that we have converted the temperature to the Kelvin scale]. Therefore, Q2 =12 W. Heat delivered to the room is Q1 = Q2+W = 12W+W = 13W. Here W is the work done by the pump. So for each joule of work done (for each joule of electricity consumed), the quantity of heat pumped out in to the room will be 13 joule. The work done in a cyclic process indicated by a PV diagram is the area enclosed by the closed curve. The area under the slanting curve showing the expansion of the gas from volume 2V0 to volume 5V0 gives the work done by the gas. This is greater than the area under the (horizontal) curve showing the compression of the gas (from volume 5V0 to volume 2V0), which gives the work done on the gas. The vertical portion of the curve is an isochoric (volume constant) change which involves no work since the area under it is zero. The area enclosed by the closed curve gives the net work done by the gas. The triangular area enclosed is ½ ×3V0×2P0 = 3P0V0 [Option (e)]. [ Note that in problems of the above type, the work is done by the gas if the arrow showing the cycle is clockwise. If the arrow is anticlockwise, work is done on the gas. In either case, the work done is the area enclosed by the curve]. This is an adiabatic change since the compression is sudden so that the volume(V) and the temperature (T) are related as TVγ–1 = constant. Therefore we have 300 V0.5 = T(V/16)0.5. Note that the temperature is to be substituted in Kelvin. The final temperature is given by T = 300×160.5 = 1200 K = 927°C. Since the work done is the area under the corresponding curve in a PV diagram, you can easily verify that the work done is the largest in the isobaric case since it is a straight line parallel to the volume axis. The adiabatic curve is the steepest one so that the area under it is the smallest. The correct option therefore is (c). 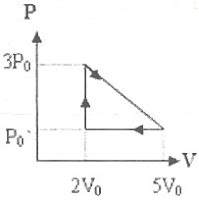 In the case of an adiabatic change, the pressure and volume are related as PVγ = constant. In the case of an isothermal change, the pressure and volume are related as PV= constant. Differentiating, PdV + VdP = 0. Slope of isothermal curve = dP/dV = – P/V. This show that the slope of the adiabatic curve is γ times the slope ofthe isothermal curve. We have PVγ = constant so that P×8005/3 = P'×1005/3 from which P' = P×85/3 = P×25 = 32P. The adiabatic compression will increase the temperature of the gas so that the final pressure (P2) when the volume is restored to the value V1 is greater than the initial pressure P1. Since the pressure is greater during the adiabatic compression, more work has to be done on the gas. The work done on the gas is thus greater than the work done by the gas. In other words, the net work done by the gas during the entire process is negative. So, the correct option is (e). (1) Myopia (short sightedness) is corrected by a concave lens of focal length ‘d’ where ‘d’ is the distance of the far point in the case of the defective eye. [Note that for a normal eye the far point will be at infinity where as for the defective eye, it will be at a finite distance‘d’]. (2) Hypermetropia (long sightedness) is corrected by a convex lens of focal length ‘f’ given by f = dD/(d – D) where ‘d’ is the distance of the near point for the defective eye and D is the least distance of distinct vision (25cm), [Note that for the normal eye, the near point will be at D and for the defective eye it will be at a greater distance ‘d’]. (3) Presbyopia is corrected by bifocal lens with the upper portion concave and the lower portion convex. [Note that for the defective eye in this case, the far point is nearer (and not at infinity) while the near point is farther away (and not at D)]. (4) Astigmatism is corrected by cylindrical lens. (5) Magnifying power of a simple microscope M = 1+ D/f if the image is formed at the least distance of distinct vision ‘D’. If the image is formed at infinity (normal setting or setting for relaxed eye), M= D/f . (i) M = (vo/uo)(1 + D/fe) if the final image produced by the eye piece is at the least distance of distinct vision ‘D’. Here uo is the distance of object from the objective, vo is the distance of the image produced by the objective and fe is the focal length of the eye piece. Approximate expressions for the magnifying power of a compound microscope in the two cases are M = (L/fo)(1 + D/fe) and M = (L/fo)(D/fe) in the two cases respectively. Here L is the tube length of the microscope, which is the distance between the objective and the eye piece. (i) M = β/α = fo/fe for normal adjustment (image at infinity) where β is the angle subtended at the eye by the image, α is the angle subtended at the eye by the object, fo is the focal length of the objective and fe is the focal length of the eye piece. (ii) M = (fo/fe)(1 + fe/D) if the final image is formed at the least distance of distinct vision ‘D’. (10) Limit of resolution of telescope (minimum angular separation between two point objects that can be resolved) dθ = 1.22λ/a where λ is the wave length of light proceeding from the object and ‘a’ is the aperture (diameter) of the objective. The image produced by the objective is formed at the focus of the eye piece since the final image is formed at infinity (for relaxed eye). If vo is the distance of the image formed by the objective, the tube length of the microscope (distance between the objective and eye piece) is vo+ fe = vo+ 4 = 12 cm from which vo = 8 cm. The magnifying power (for relaxed eye) is given by M = (vo/uo)(D/fe). Substituting the known values, 25 = (8/uo)(25/4) from which uo = 2 cm. [Option (a)]. The magnifying power, M = (L/fo)( D/fe) = (10/0.5)( 25/1) = 500. You should note that the focal length of the objective in a microscope is less than that of the eye piece. (In a telescope it is the other way round). Therefore, fo = 1.5 cm and fe = 6.25 cm. The distance between the objective and the eye piece is the sum of the image distance(vo) for the objective and the object distance (ue) for the eye piece. 1/1.5 = 1/vo – 1/(–2). 1/6.25 = 1/(–25) – 1/ue. Note that the sign of the object distance is negative in accordance with the Cartesian sign convention. This equation yields ue = –5 cm. The negative sign just shows that the object distance for the eye piece is measured opposite to the direction of the incoming rays.In fact, we know that the real image (of the object) formed by the objective serves as the object for the eye piece and therefore its distance is negative. However, since ue is an unknown quantity, we did not bother about its sign. If we had substituted its sign as negative in the law of distances, we would have obtained the value as +5 cm. The distance between the objective and the eye piece is 6+5 =11 cm. His defect is myopia and hence he should use a concave lens of focal length equal to the distance of the far point, which is given as 10m. The power of the lens is 1/(–10) = – 0.1 dioptre. As his defect is hypermetropia (long sightedness), he should use convex lenses of focal length ‘f’ given by f = dD/(d – D) where ‘d’ is the distance of his far point and ‘D’ is the least distance of distinct vision. Therefore, f = 65×25/(65 – 25) = 40.6 cm. We have magnifying power, M = fo/fe so that 25 = fo/fe, from which fo = 25 fe. Sincethe length of the telescope = fo + fe, we have 52 = 25fe + fe = 26 fe so that fe = 2 cm and hence fo = 50 cm. The distance between the earth and the moon is nearly 3.8×105 km. What is the separation of two points on the moon that can be just resolved using a 400 cm telescope, using light of wave length 6000 Ǻ? The limit of resolution dθ = 1.22λ/a. This is the minimum angular separation between objects that can be just resolved. The linear separation between the objects that can be just resolved is rdθ = 3.8×108×1.22×6000×10–10/4 = 69.5 m. [Note that we have converted all distances in to metre]. the magnifying power of a telescope is given by M = β/α = fo/fe with usual notations. Therefore, β = α fo/fe = 0.5×100/2 = 25º [Option (b)]. A telescope has an objective lens of focal length 1.5m and an eye piece of focal length 5 cm. If this telescope is used in normal setting to view a tower of height 100m located 3km away, what will be the height of the image of the tower? 100/3000 = h/1.5 where ‘h’ is the height of the image produced by the objective. [Note that this image is at the focus of the objective]. From the above, h = 0.05m = 5 cm. The magnifying power of the eye piece in normal adjustment is D/fe = 25cm/5cm = 5. The height of the final image = 5h = 25 cm. (a) Medical (i) MBBS (ii) BDS (iii) BPharm (iv) BSc (Nursing) (v) BSc (MLT) (vi) BAMS (vii) BHMS (viii) BSMS (Siddha) (ix) BSc–Nursing (Ayurveda) and (x) BPharm (Ayurveda) . The Entrance Examinations will be held in all the District Centres in Kerala, New Delhi and Dubai (UAE), on the dates mentioned below as per Indian Standard Time. 23-04-2007 Monday 10.00 A.M. to 12.30 PM Paper-I: Physics & Chemistry. 24-04-2007 Tuesday 10.00 A.M. to 12.30 PM Paper-II: Mathematics. 25-04-2007 Wednesday 10.00 A.M. to 12.30 PM Paper-I: Chemistry & Physics. 26-04-2007 Thursday 10.00 A.M. to 12.30 PM Paper-II: Biology. Admission to the BPharm course will be based on a separate rank list prepared on the basis of the performance of candidates in the ‘Chemistry & Physics’ Paper of the Medical Entrance Examination. Those who wish to be considered for admission to the BPharm course should therefore appear for the Chemistry & Physics Paper of the Medical Entrance Examination. The application form and Prospectus will be sold from 07-02-2007 to 05-03-2007 through selected Canara Bank branches in Kerala and outside the State. Last date and time for receipt of filled in Application Forms: The filled in Application Form along with the OMR DATA SHEET and other relevant documents to be submitted with the Application form is to be sent in the printed envelope bearing the address of the Commissioner for Entrance Examinations supplied along with the application form so as to reach him before 5 p.m. on 07.03 200 7, by Hand Delivery / Registered Post/ Speed Post. 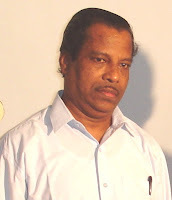 Visit the site www.cee-kerala.org for complete details about the eligibility for applying for the examinations, sale centres of application forms, provision for downloading the application form in the case of certain categories etc. Visit the site to be informed of the latest developments in this regard. After waiting for some time, I have switched over to the new version of Blogger today. The switch over was quite easy. I will have to spend some time on effecting a few changes in the lay out as well as the look of my blog. The priority will be in posting new questions and solution since examinations are fast approaching. Thank you Blogger Staff for effecting the transition out of beta in a relatively short time span! (2) Frequency of vibration of a string, n = (1/2l)√(T/m) where ‘l’ is the length of the string. Note that this is the frequency in the fundamental mode. Generally, the frequency is given by n = (s/2l)√(T/m) where s = 1,2,3,….etc. In the fundamental mode, s = 1. (3) Speed of sound (v) in a medium is generally given by v = √(E/ρ) where E is the modulus of elasticity and ρ is the density of the medium. v = √(γP/ρ) where γ is the ratio of specific heats and P is the pressure of the gas. (b) Velocity of sound in a solid rod, v =√(Y/ρ) where Y is the Young’s modulus. where A is the amplitude, λ is the wave length, v is the velocity (of the wave) and φ is the initial phase of the particle of the medium at the origin. (v) Another form of the wave equation is y = A sin (ωt – kx), which is evident from the form shown at (iii), where k = ω/v = 2π/λ. Note that unlike in the case of the equation of a simple harmonic motion, the wave equation contains ‘x’ in addition to ‘t’ since the equation basically shows the variation of the displacement ‘y’ of any particle of the medium with space and time. y = A sin (ωt + kx). Note that the negative sign in the case of the equation for a wave proceeding along the positive X-direction is replaced with positive sign. (7) Equation of a stationary wave is y = 2A cos(2πx/λ) sin(2πvt/λ) if the stationary wave is formed by the superposition of a wave with the same wave reflected at a free boundary of the medium (such as the free end of a string or the open end of a pipe). y = – 2A sin(2πx/λ) cos(2πvt/λ). Don’t worry about the negative sign and the inter change of the sine term and the cosine term. These occurred because of the phase change of π suffered due to the reflection at the rigid boundary.The important thing to note is that the amplitude has a space variation between the zero value (at nodes) and a maximum vlue 2A (at the anti nodes). Further, the distance between consecutive nodes or consecutive anti nodes is λ/2. (e) a similar wave generated by reflection at a rigid boundary. The equation, y = A sin[2π/λ(x – vt)] can be written as y = – A sin [2π/λ(vt – x)] and hence it represents a plane progressive harmonic wave proceeding along the positive X-direction itself, but with a phase difference of π (indicated by the negative sign). This is a very simple question. The particle velocity is v = dy/dt = –Aω cos(kx– ωt) and its maximum value is Aω. This MCQ appeared in AIEEE 2003 question paper. The wave equation given here contains an initial phase π/3 but that does not matter at all. You can compare this equation to one of the standard forms given at the beginning of this post and find out the speed ‘v’ of the wave. If you remember that velocity of the wave, v = Coefficient of t /Coefficient of x, you get the answer in notime: v = 600/2 =300 ms–1. Velocity of sound in a diatomic gas is 330m/s. What is the r.m.s. speed of the molecules of the gas? At a temperature T, the velocity of sound in a gas is given by v = √(γP/ρ) where γ is the ratio of specific heats and P is the pressure of the gas. The r.m.s. velocity of the molecules of the gas is given by c = √(3P/ρ). Therefore, c/v = √(3/γ). For a diatomic gas, γ = 1.4 so that c/v = √(3/1.4). On substituting v=330m/s, c = 483m/s. If n1 and n2 are the frequencies of the sound waves, n1– n2 =12 or, v/λ1– v/λ2 =12. Substituting the given wave lengths (0.5m and 0.51m), the velocity v works out to 306 m/s. This stationary wave is in the form y = 2A cos(2πx/λ) sin(2πvt/λ) so that 2π/λ = π/8 from which λ = 16cm. The distance between consecutive nodes is λ/2 = 8cm. You can find all posts on waves in this site by clicking on the label 'waves' below this post or on the side of this page.